If you're new to the world of scrapbooking and feeling overwhelmed by your huge stacks of photos and the endless product choices at your local craft store, pick up a copy of Cathy Zielske's Clean & Simple Scrapbooking to learn how to create breathtaking layouts with a minimal amount of fuss. Trained as a graphic designer, Cathy now uses her creativity to inspire scrapbookers from across the world. She's a contributing editor at Simple Scrapbooks magazine and travels around the country teaching scrapbooking workshops to those who aspire to mimic her classic yet hip sense of style. 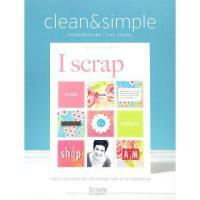 First published in 2004, Clean & Simple Scrapbooking is an essential reference for scrapbookers who want to preserve their memories without wasting a lot of time, money, or energy. In her book, Cathy encourages readers to focus on their most meaningful photos and let go of the pressure to create labor-intensive pages. By creating crisp, graphic-inspired layouts, Cathy believes you'll let your photos and journaling take center stage in your albums. While Cathy's writing is lively and engaging, the real centerpiece of Clean & Simple Scrapbooking is the jaw-dropping layouts she shares from her personal albums. As the mother of two children, Cathy frequently creates pages with kid-related themes. However, you'll also find plenty of ideas for layouts about your spouse, pets, friends, hobbies, and childhood memories. As Cathy writes, "This hobby is about honoring who we are, how we fit into the grand scheme of life, and everything in between. In short--the good stuff." If Clean & Simple Scrapbooking leaves you hungry for more scrapbooking inspiration, run to your nearest bookstore and pick up a copy of Clean & Simple Scrapbooking: The Sequel. Cathy learned to make 12x12 scrapbook pages after the release of her first book. She's started to mix handwriting and stamped titles with her computer journaling. Instead of working almost exclusively with black and white photos, she's started to let the color come through. Although her work is still clean and uncluttered, she's begun to experiment more with the latest styles of patterned paper and embellishments. 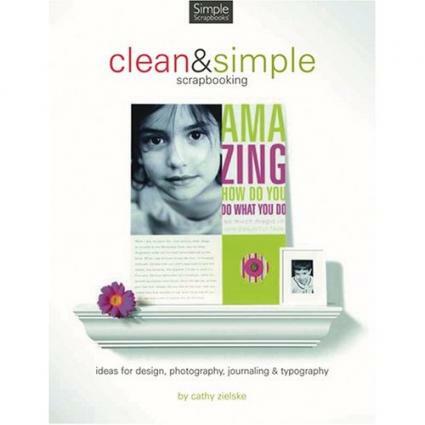 Although Clean & Simple Scrapbooking: The Sequel touches on many of the same points as Cathy's first book, it also discusses more advanced topics such as developing concepts for theme albums, coming up with innovative ways to scrap photos from vacations or holiday celebrations, creating a style file, and finding scrapbooking inspiration in the world around you.